Mexico’s President Felipe Calderón stated that in view of the challenge of stopping organized crime, he has used everything in his power to stop crime and made citizens’ safety Federal Government’s highest priority and main task. After swearing in the athletes in the Mexican delegation who will participate in the 2008 Beijing Paraolympic Games, the President recalled the fact that the National Security, Justice and Legality Agreement, designed to create a safer country, was signed yesterday. He stated that the branches of government, governors, civil society and media assumed specific commitments regarding public safety, together with specific deadlines, as a result of which it is now up to everyone to do his or her part so that Mexicans will be able to see results soon. 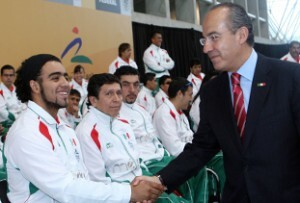 He told an audience of Mexican athletes that one way of combating the lack of safety on the streets is to provide opportunities for sport in Mexico, as a form of entertainment, personal discipline and physical training that will provide better living alternatives, particularly for children and young people. “For the sake of Mexicans’ personal and human development, safety and health, we must turn sport in Mexico into an everyday practice accessible to everyone,” he explained. The President expressed the admiration felt by all Mexicans over the Para-Olympic sportspersons’ ability to overcome adversity, set new goals and achieve major triumphs. He explained that with a view to their participation in these Para-Olympic games, Federal Government has supported their efforts and for the first time in history, created a Special Scholarship Program, which will assign $30 million pesos for their training. Lastly, the president remarked that all of Mexico will be following them and encouraging them so that the effort they have made so far is transformed into success.